High-speed rail in China refers to any commercial train service in the China with an average speed of 200 km/h (124 mph) or higher. 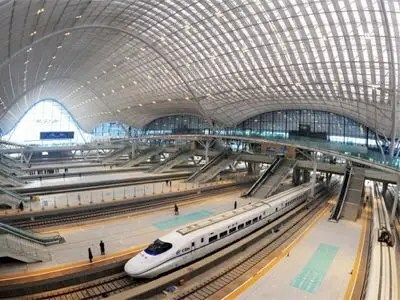 By that measure, China has the world’s longest high-speed rail (HSR) network with about 9,676 km of routes in service as of June 2011 including 3,515 km of rail lines with top speeds of 350 km/h (186 mph). In 2010, the BBC reported that by 2012, China was expected to have more high-speed railway track than the rest of the world combined. China’s high speed rail expansion is entirely managed, planned and financed by the government. In response to the global economic recession, the government accelerated the pace of HSR expansion to stimulate economic growth. According to China Securities Journal, China plans to invest $451 to $602 billion in its high-speed rail network between 2011 to 2015. The real-name train ticket policy has been applicable to high speed and bullet trains (C, G, D trains) since June, 2011. From January 1, 2012, this policy applies to all trains in China. The real-name train ticket policy is taken to relieve the difficulty in buying train tickets and effectively stop scalpers who profit a lot in trading train tickets especially during the Spring Festival travel rush every year. Passengers should buy train tickets and get on trains with the presentation of their own valid ID certificates or passport. One valid certificate is allowed to buy one ticket on the same date and in the same train, except for tickets of children with accompanying adults. Shanghai is in high-speed heaven: it not only boasts a Maglev, but also features direct HSR links to all major cities in the Yangtze River Delta region.